I was quite happy already with average thai green curries from ThaiExpress and from Singapore hawker stalls, but that was before I got to try a real thing. My friend and I went to Siem Reap (Cambodia) to see the Angkor Wat temples. We had three lovely days there, but the day we were going back to Singapore we missed our flight. We found ourselves early in the morning at that tiny airport, which was still sleeping. We had our 30 or 40 minutes of running back and forth from one airline office to another before we got clear that there was no fast way to get out of there (not just same day but even in two days perspective). I felt very guilty and our wrong timing was in fact my fault. But my beautiful friend just said "come over it Maria" "let's just do something cool instead". So we started looking at options to fly somewhere else. After a little struggle between Bangkok and Kuala Lumpur (Malaysia), we decided on the first and rushed to get the tickets. Couple of hours after we were at thai capital. The receptionist at Holiday Inn suggested that little place to us and we went there. The name is in the picture, but I've no idea how to pronounce it. We came in, set down and ordered as always: tom yam + phad thai for my friend and vegetable green curry for me. There it was the right one and the amazing one. Pale, with a light green tint. Creamy and a little sweet. Boiling hot and spicy. With plain, not even salted steamed thai rice on the side. I have to say that in the curry I was always mainly after the sauce itself and not what was in it. So I often scooped out the green magic liquid and left most of the veggies or shrimps untouched. My friends were making fun of me watching this behavior, but I was completely serious. I could see no point in putting so many veggies into the bowl and leaving so little space for the main thing. So when I make it for myself it is rather lots of curry sauce with a bit of selected veggies floating in it. The veggies I certainly do like in the curry are apple eggplants. If anything else - baby corn. When I came back home I had a couple of tries of making the curry from AROY-D thai green curry paste, which is available from Indian spices store, and I figured out the paste has no chance of producing something at all similar. When I looked at the list of ingredients I'd need to make it from scratch I got clear that many of them were not available in Moscow at all. So I forgot about this idea for many months before the last week. This time I got all the ingredients I could find, replaced some, left out some and got a result which made me quite happy. My primary sources of ingredients in Moscow were Indian spices store and Chinese products store. I certainly achieved that right curry texture and color. The smell and taste were both a bit different from Bangkok, but very similar. And by all means, no comparison to the ready made paste. My most important source of information was this Thaifoodmaster video. Whenever I replaced or left out some ingredient it is noted in the recipe. It is hard to make a small quantity of curry paste, so if you are cooking 1-2 servings, it is worth making more paste and freezing what you don't use immediately. To serve the curry you will need steamed rice. I have a simple technology of cooking very good rice without a steamer, which I also describe below. Slightly heat the oil in a small pan. Add the curry paste and cook stirring over medium-low heat for 2-3 minutes till it gets very fragrant. Start adding coconut cream by 1-2 table spoons at a time. Mix it in and wait till it boils and incorporates into the paste before adding more. Continue till all the coconut cream is in. Add the eggplants, bring to a light simmer and cook over low heat for 5 minutes. Season with palm sugar and fish / soya sauce to taste. Add kaffir lime leaves, basil and wild ginger with pea eggplants (if using) and simmer for another 30 seconds. 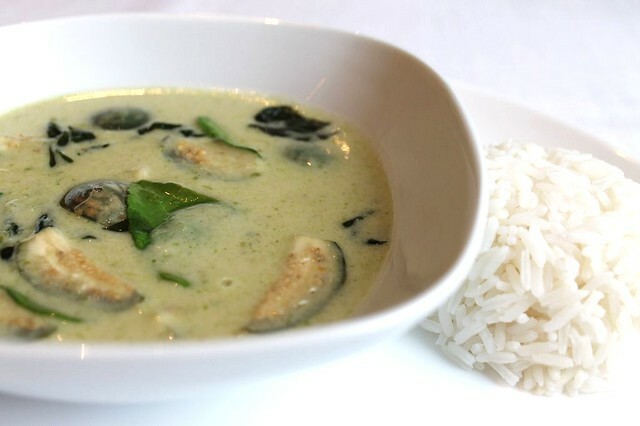 Serve hot with steamed thai rice on the side (recipe below). Roughly chop the vegetables. Powder white pepper, coriander and cumin in a mortar (or use ground). Place all ingredients in a food processor. Process till you get an almost smooth and even paste. Add 1-2 table spoons of vegetable oil if needed to help it blend. Use right away or freeze in a plastic bag. All traditional recipes require you to avoid food processor and do everything with mortar and pestle. If you are strong and patient enough, do so. I do not have a rice steamer, so I cook the rice on the stove. Combine the rice and water in a pan. Put the lid on, bring to a boil, reduce the heat to low and cook for 12 minutes. Do not open the lid. Turn the heat off and leave it the rice to rest under lid for another 12 minutes. Then take the lid off and stir with a fork to make it airy. 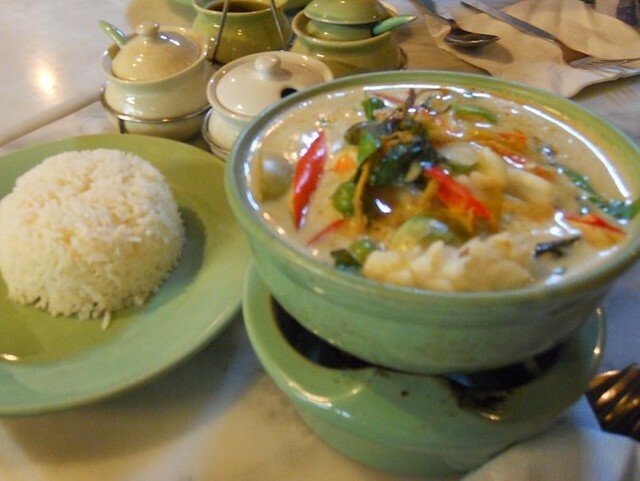 And I totally adore the Celladon Pottery in which you got the thai rice & green curry served. Thank you so much my friend! Yes, here making it yourself makes so much difference.